In February 1930 work started to improve ‘the most dangerous corner’ in Upwey. A council report stated this was the scene of more motor accidents than even the famous hairpin bend on Ridgeway Hill. 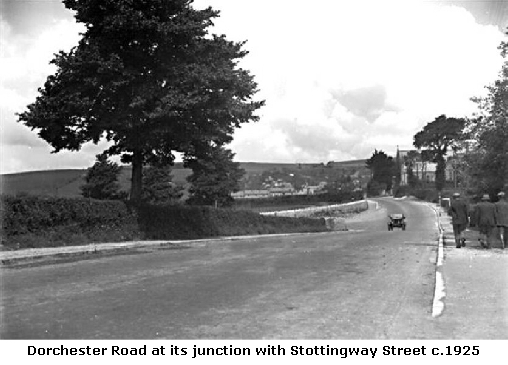 The steep climb up Stottingway tempted motorists to rush the last bit and many accidents led to the RAC posting a scout to control the traffic. The corners were rounded off; a footpath created for pedestrians; hedges lowered and set back to give a better view across the corner. 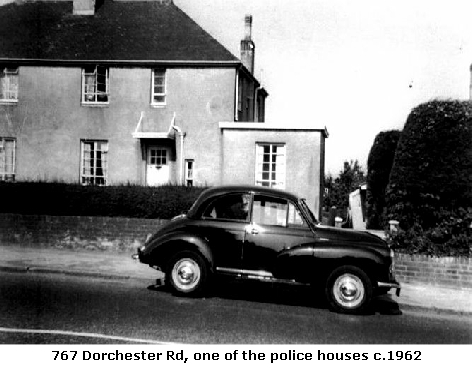 In 1938 land was acquired at the junction of Stottingway Street for the building of two police houses (765 and 767 Dorchester Road). There was a wooden office attached to the side of 765 which had a desk and telephone. A detached house (763), built a little later, was the Sergeant’s house, with constables living in the other two. Serving police officers lived in the houses until the 1980’s, although after the mid 1960’s they were not necessarily the ‘local bobby’ and are now private residences. In 1973, 640 Dorchester Road (at the junction with Victoria Avenue) was demolished and replaced with 15 flats, Cassea Court. In 2006 permission was granted to demolish 642 and 644 Dorchester Road and replace with 26 flats in 4 blocks. 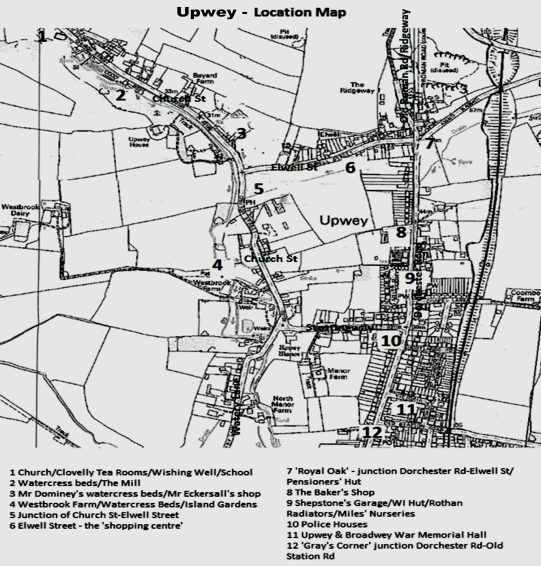 ‘Gray’s Corner’ is where Upwey meets Broadwey as the parish boundary runs up the centre of Old Station Road. 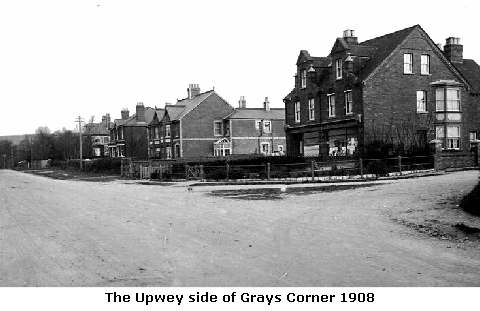 Getting the name from the family grocer’s shop (on the Broadwey side) established by Mr J E Gray, in the early 1900’s. 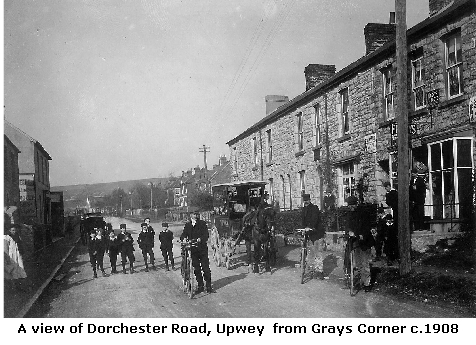 On the Upwey side was the ‘Draper and Milliner’ shop run by Mrs Wright and her daughter (626/628 Dorchester Rd). Before the property was built there was a duck pond on the site, where horses and traction engines were able to fill up with water. After the property was built, the Railway Hotel opposite, found that their floors were always wet. After many complaints the brewery investigated and found that filling in the pond had forced the water over the road. Better drainage was provided to resolve the problem. By the 1960's the shops were run separately. The shop on the left continued as a haberdashery, referred to as the 'Wool' shop and run for many years by Mrs Cary; by 1969 Mrs Sheppard was trading as 'Eileen's'. In the 1980's the shop became 'The Spinning Wheel' which in addition to knitting wool sold tapestry wool and items of wool craft. 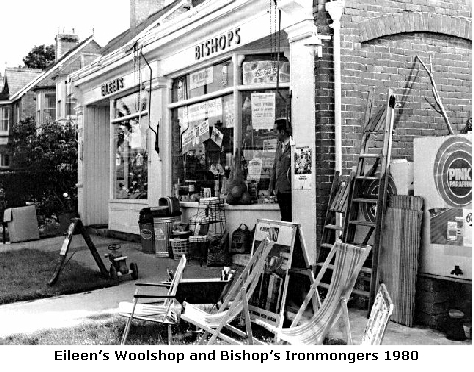 The right hand shop became Bishop's ironmongers, where you could purchase almost anything from Pink Paraffin to kitchen utensils and deck chairs! Mr Bishop retired in 1981; the shop continued trading as Dee & Em Hardware then Watts Hardware. The shop closed in the late 1990's. In 2005 permission was granted to demolish the buildings and erect residential houses, these were completed in 2009. 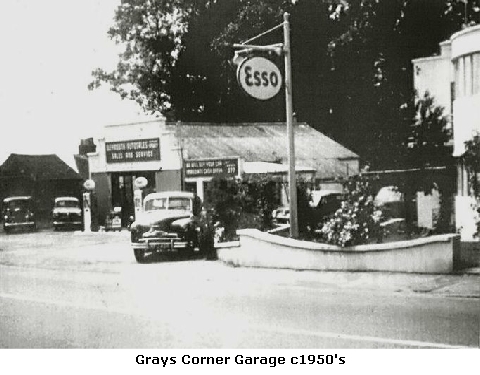 On the opposite side of the road was a garage built by local builder, Harry Marsh, in the 1930's. During the war it was commandeered by the Americans, the sight of their Harley-Davidson motorcycles a particular draw for the village youths. The house was of a very modern design. 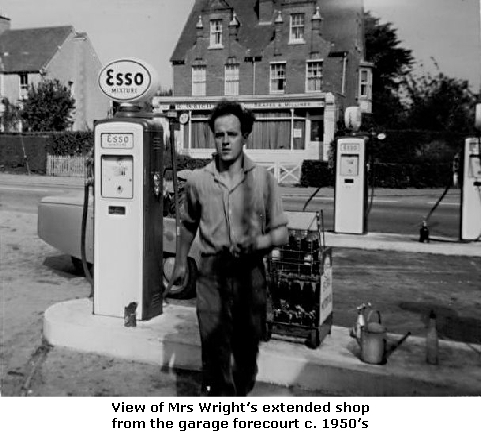 The garage was run by many different people over the years, including in the late 1940's/early 1950's the Hilton family. Mrs Hilton did teas in the room with the curved window. In the mid 1950's the Napper family were in charge. 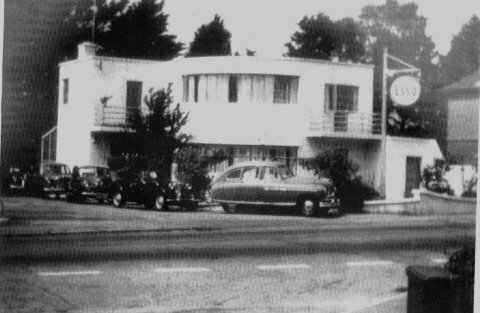 Sometime around the late 1960's/early 1970's the house was demolished as it was considered unsafe for houses to be so close to petrol storage tanks. 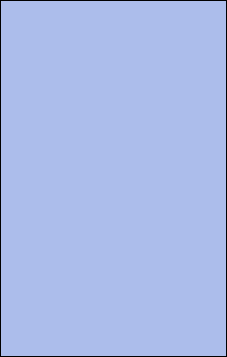 By 1977 the site had been completely redeveloped. 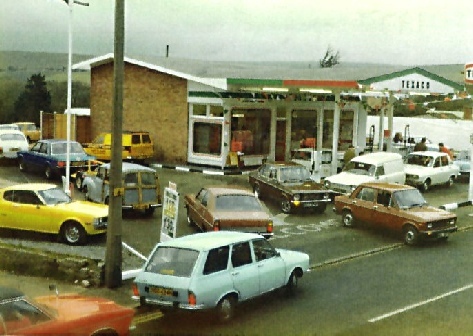 The opening of the Texaco garage run by Simon Flower in 1977. 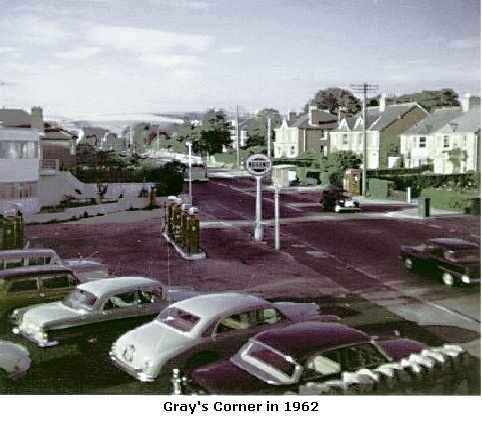 A special price on petrol (£1.30 a gallon for four star) led to the road becoming blocked with queuing cars. A one-way system around the garage helped to get the cars off the road. Return to Dorchester Road 2/3 …..